Thu, Sep 6, 2018, 03:01 pm SL Time, ColomboPage News Desk, Sri Lanka. Sept 06, Colombo: The second national Public-Private Dialogue (PPD) on Sri Lanka's E-Commerce Reform, backed by Geneva's International Trade Centre (ITC) opened today in Colombo under the patronage of the Minister of Industry and Commerce Rishad Bathiudeen. The national Public-Private Dialogue (PPD) titled "A Roadmap for E-Commerce Reform" organized by the Consumer Affairs Authority (CAA) and the Geneva-based International Trade Centre (ITC)'s will take place on 6-7 September. The PPD is a part of the EU-Sri Lanka Trade Related Assistance project, worth EUR 8 million funded by the European Union (2016-2020). Welcoming the second PPD, the Minister said the it has been planned to establish a modern consumer protection framework suitable for e-commerce marketplace and encourage the development of Sri Lankan digital economy by improving access to the Internet emphasizing education and awareness of the digital economy removing legal and market barriers as well as fostering trust among both Sri Lankan consumers and SMEs. Head of Cooperation of the Delegation of the European Union Frank Hess said the second Public-Private Dialogue is an important platform for bringing together key people and agencies to use collective expertise in continuing the advancement of the Sri Lankan legal framework for e-commerce, and more importantly to contribute to the growth of the Sri Lankan economy. The PPD will build on the outcomes of the first dialogue, which took place from 15-16 March 2018, and on the recommendations made to improve the Sri Lankan E-Commerce marketplace. The Dialogue aims to discuss the five key areas identified i.e. access, education, awareness, payments and modernization of consumer protection laws & privacy, in the roadmap for future reforms. It will also provide an overview of international best practices in these five areas, an opportunity for the lead organizations in each of the five areas to discuss future courses of action-including a legislative/regulatory gap analysis of existing laws-discuss the way forward in crafting legislative proposals that will update national laws and provide an opportunity for the private sector to participate in the reform process. 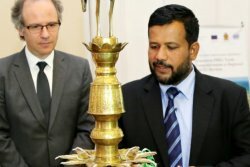 The PPD will bring together key stakeholders such as the Ministries of Telecommunication & Digital Infrastructure, Industry & Commerce, the Communication Technology Agency of Sri Lanka, University of Colombo, Central Bank of Sri Lanka, Ceylon Chamber of Commerce, and the Information & Communication Technology Agency of Sri Lanka.